A Pennsylvania State Police cruiser. 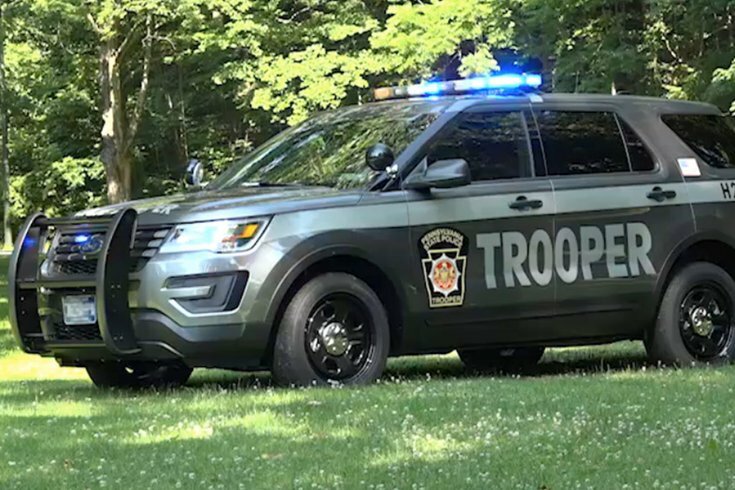 A Lancaster man who fled from Pennsylvania State Police on Friday was shot multiple times by state troopers after he pointed a BB gun at them, prosecutors said. The shooting occurred around 1 a.m. in West Nottingham. Two state troopers executed a vehicle stop on a white van with a non-functioning rear brake light, according to a preliminary investigation. The driver, identified as 42-year-old Jeremy Oatman, had an open criminal warrant, and he was alone in the vehicle. Investigators said Oatman fled the scene in his van, leading the troopers on a high-speed chase. At one point during the pursuit, Oatman allegedly pointed what appeared to be a pistol at the troopers. Oatman eventually crashed his van into an embankment outside a CVS Pharmacy. After the crash, the troopers said Oatman jumped out of his vehicle and point the gun at them. Both troopers opened fire, striking him multiple times. When the troopers recovered Oatman's gun, they found that it was a "very realistic looking" BB gun. Oatman was hospitalized and treated for non-life-threatening injuries. He's charged with aggravated assault, simple assault, fleeing and eluding, and related offenses. Chester County Detectives will complete an independent review for District Attorney Tom Hogan to determine whether the shooting was justified.